Fast and featureful file manager in vim/neovim powered by nnn. You must install nnn itself. Instructions here. To open nnn as a file picker in vim/neovim, use the command :NnnPicker or :Np or the key-binding <leader>n. You can pass a directory to :NnnPicker command and opens nnn from there e.g. :NnnPicker path/to/somewhere. Once you select one or more files and press enter, vim quits the nnn window and opens the first selected file and add the remaining files to the arg list/buffer list. Pressing enter on a file in nnn will pick any earlier selection, pick the file and exit nnn. To discard selection and exit, press ^G. Please visit the complete documentation by running :help nnn. let g:nnn#layout = 'new' " or vnew, tabnew etc. You can set extra key-bindings for opening files in different ways. Nothing is set by default to not override nnn's own key-bindings. For example, when inside an nnn window, pressing ctrl-t will open the selected file in a tab, instead of the current window. ctrl-x will open in a split an so on. Meanwhile for multi selected files will be loaded in the buffer list. When you want to override the default nnn command and add some extra flags. Example you want to start nnn in light mode. The nnn#pick([<dir>][,<opts>]) function can be called with custom directory and additional options such as opening file in splits or tabs. Basically a more configurable version of :NnnPicker command. edit - type of window the select file will be open. layout - same as g:nnn#layout and overrides it if specified. 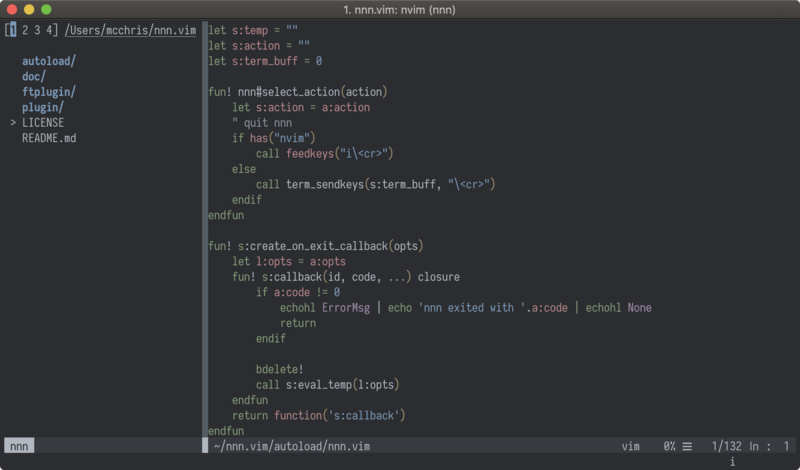 You can define env variables in vimrc and nnn will detect it.